Update: As Orion development evolves, some of the information below became outdated. Check out the Dev Diary #8 for more up-to-date info! A lot of you have patiently waited for us to deliver on our promise and provide you with a bulletproof backup solution that your websites direly need. It’s time to reward your patience – the new backup app is being released tomorrow, on May 5, into the ManageWP Orion closed beta and it’s jam-packed with new features. The first thing you’ll notice is how easily your website server is running backups. The new Orion backup runs just a small fraction of the process on your website server; the vast majority of the work is done by our own server infrastructure, built specifically for this purpose. With the help of our Hibernation technology, your website is queried for content, which is then uploaded to our Hibernation Pod (our cloud storage infrastructure) where a backup archive is assembled. And the best part? The load on your site server is little more than a regular website visit. Scheduled backups are obsolete now that we’ve switched to real-time protection. The new Hibernation tech allows you to run incremental backups every hour, 24 hours a day, 7 days a week. That’s 720 restore points each month! With the resource issues resolved, there is no upper limit to the size of the website you can back up, both in terms of the physical size and the number of files. 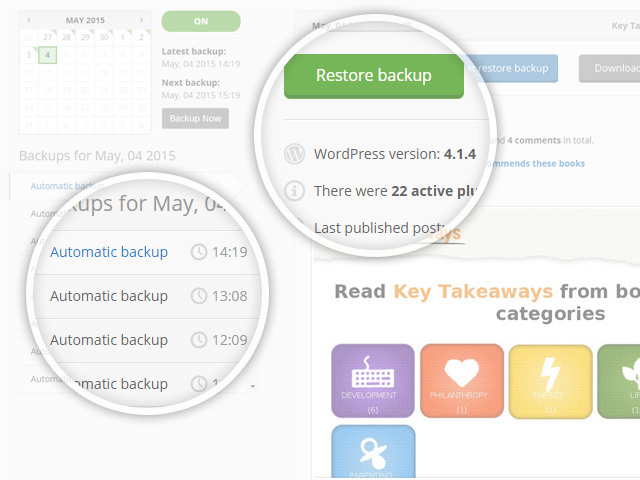 The backup is incremental, meaning that after the initial backup, only the changes you make are tracked and uploaded. Instead of creating a 10GB backup each and every time, you just run a backup for those 2MB for your latest post. Storing backups on the website server is a bad choice for a number of reasons – hackers could access your FTP and hijack the whole website; with larger websites you could easily burn through your physical space; but most importantly, if something happens to your server, your only chance of getting things back on track has crashed with the server. That’s why we’ve decided to assemble and store your backups on Hibernation Pod – our cloud storage solution that makes it ridiculously easy to store and restore your website backups. Some managed hosting companies, such as WP Engine and Pagely, restrict PHP backups because they interfere with server performance. This is no longer the case. The traffic and server load are only a little higher than a regular site visit, so there’s no need for the hosting companies to throttle or terminate the ManageWP Orion backup script. This is very important because you ask us all the time if ManageWP plays nice with hosting company X – from now on we play nice with everyone. You know how the old ManageWP backup works. It’s a PHP script relying almost exclusively on your website server resources, similar to other major backup plugins such as BackupBuddy or Updraft Plus. It’s quick, it’s dirty and it’s resource intensive. The problem is, if you run a serious business, anything less than a 99% backup success rate is unacceptable. Our research showed that ManageWP and similar major solutions deliver ~80% success rate with default settings, and in some cases require a lot of compromises to run reliably. You probably know all this all too well. We explored all possible options and concluded that further optimization would hit the ceiling at ~85%. That’s why we came up with the Hibernation technology. It allows us to achieve that magical 99% success rate by running low-intensity processes off-site and utilizing incremental backups, Hibernation Pod storage and a number of other optimizations. In the upper left corner of the screen you’ll see the backup calendar with information about your backups. There are two buttons: Backup Now if you want to create a backup right away, and ON/OFF, which is the only button you need to click to turn your real-time backup on and off. The lower right part of the screen is a screenshot of your website at the moment the backup was created – this is great if your theme broke down or the website has been defaced and you’re looking for the latest functional backup to restore. Above the screenshot, you’ll find more information about the backup: WordPress version, the number of plugins, posts, comments, the latest published post and the active theme. Please note that at the time of writing we’ve disabled the Test restore backup and Download backup buttons – once the internal tests are successful you will be able to play with them to your heart’s content. That’s it for this blog post. We have a lot more going on, so expect the next Dev Diary next week, with more information about Orion apps. If you have any comments, suggestions or feedback, please let us know. We’re very excited with the road ahead and the tools we’re building to help you run your business efficiently and reliably. UPDATE: ManageWP Orion Developer Diary #4 is out! Read about the client report, additional backup features and more! How long are the backups kept in Orion on your Amazon S3 servers? I’ve replied in the other article, but I’ll reply here as well, in case someone else is interested. Right now they’re kept indefinitely, but once Orion goes commercial, we will probably introduce a time limit. What I can say right now is that it will be at least 90 days. Does the backup just backup the database or both the database and files? Both the database and files. It’s also incremental: each subsequent backup only uploads changes, so everything’s faster and more reliable. Is there any chance I could get an invite to this? My biggest problem and reason for looking for other management solutions has been the backup troubles and I’d love to be able to test / use this. Sure thing, I’ve added you to the next batch of invites. This looks fantastic, have tried quite a few different options to try and get around the resource issue. Some sites just will not reliably backup and it puts a huge drain on our time having to ensure that backups are complete and completed properly. It would be awesome to start testing out this platform, would love an invite if you are still handing them out. I have expressed my opinion in a support ticket, but will do here as well. It think the backup solution goal is incredible, but without offsite backup locations it is far from a successful product. What if your service OR Amazon (PODS) is not available? If it is on a NAS on my network or even dropbox, it is always available AND secure. Also, I like to keep 8 days of running DB backups, 5 full site weekly backups and 3 full site monthly backups. This is standard disaster recovery 101, If I get a virus say, I can restore for a backup 3 months prior. If your service is not available, say the internet goes down, I have a copy here on my network and my developers can continue to work. I can’t stress this enough, remote backups are invaluable, if you haven’t got much feedback yet stating that is is because people haven’t realized it yet. 3) A recent survey by CodeGuard showed that only 24% percent actually use backup plugins, even though the vast majority thinks backups are important. The hard truth is that even the WordPress professionals want as little hassle as possible with the backups, which is why we cut down the ~12 decisions from our current backup interface to just one (On/Off) in the Orion release. Really excited to try the new backup! I currently have 2-3 sites that just won’t do to on your current system. I’m near launching a new WP maintenance addition to my business and will really need the backup. I was informed on June 8 that I would get an invite but so far have not? Any other steps I need to take? You should have gotten the invite in your inbox by now. If you haven’t, please let me know. We’ve got a lot of people looking to join the beta, so we’re throttling the invites. This sounds really good as have had some issues with automated backups recently to my present hosts. Would love to try this out as an alternative to Dropbox although I have full pro account there. It will be good to see what the costs are to have such a reliable backup service. Please add me to the next release. I’ve added you to the beta tester queue, you will get the invite with the next batch of testers. This looks incredible guys, amazing job! I am just starting out and trying to automate many tasks across numerous sites, such as backups and plugin updates, and would love to help test the beta if possible! Hi, this looks like an amazing addition to ManageWP. Would I please be able to join the beta to help testing? Just starting out and trying to find an ideal solution for certain tasks across multiple websites, and this looks pretty close! I am already hooked on Orion. I now have all 42 of my own and client sites on the beta, nicely sorted into 6 groups, all backing up smoothly. The way they are organised, the speed of the response on actions I can currently perform like spam comment management and plugin updates, the display of things like Analytics … the whole package is efficient, stylish, easy to use and thoroughly seductive. There is more to come, I know (and backup to Dropbox is up there with what I’d like to see) but it is clear MWP is setting new standards with Orion. I have previously been part of the 2.something % of users who drew on support for various issues but it looks like that is in the past. I look forward to your continuing progress. Cheers. The new backup feature is really great and works so smooth. At first I didn’t quite understand why my site would need backing up every hour, but I think it is easier to implement a “one-schedule-fits-all” like this, than to offer all kinds of different schedules per account/site. I was interested to know how well the restore function worked (something I think people usually don’t want to use) so I destroyed my test site after running the first few backups. I will happily test the beta. Particularly on backups over 500MB, I have several sites that currently fail at this. I used the new backup for a few days now and it worked like a charm! Please add the download feature for the whole backup and for single files / folders of tree view soon! A possibility to transfer backups automatically from Hibernation Pod to my Dropbox or FTP-Server would also be very nice. Please consider this feature. No worries, we are currently working on enhancing the backup experience in this way. I’m interested in giving the beta a try too. Could you send me an invite? Are there any open slots for beta? I’d be interested in giving a shot too..
just a little general question, when you make a backup do you backup the whole database or just the WordPress parts of the database (in case there are not only the WordPress tables in it). If we ran backups of the whole database we would face too many unknown factors and too many MacGyver scenarios – each one of them could cause an avalanche of issues down the line. Good morning folks! I just happen to have been swamped for the last 3 days and have finally just now had a chance to go play with the new backups. I guess I haven’t been paying close enough attention, but I didn’t realize it was going to be incremental – this is fantastic! I love the UI choices you’ve made too. It’s all making sense and I’m very excited to dig into it a little more. I’m sure I’ll find something to request 😉 Thanks for your dedication to quality! Wow Orion is looking incredible! I would love to join the beta if there is a spot open! Is it too late to get in the closed Beta? I would love to try this out! Dislike losing the option to backup to Dropbox. Can anyone still get in on this action? I’d like to try this out as I’m a new customer about to set up backups for the first time anyway. Impressive. Can’t wait to see it in action (or NOT see it, if you know what I mean). Just another reason to choose ManageWP over the competition, and another reason ManageWP is superior. Keep up the great work, folks! Everyone who expressed interest in the Orion closed beta up until this point will get an invite via email within the next 24h. Please don’t hesitate to spam us with your feedback! Alright! I’m one of those for whom my 40+ client site backups have been a right royal pain, even with ManageWP. So I trialled Orion’s backup facilities with four of my most problematic sites: one that is self-hosted by a client (has never backed up at all), one that is hosted by an external host (sometimes backs up, mostly doesn’t), one that I host but for some reason has never backed up via MWP) and one that I host that backs up well via MWP but is dauntingly large (10 years of posts will do that). First attempt at using Orion’s backup: complete success for all four. Check this morning to see if incremental backups are working: complete success for all four. For all of you who think this feature sounds amazing, fantastic, awesome: you are 100% right. Congratulations, Nemanja and ManageWP, you have completely changed the game for multi-site WP backups. Stunning work. I can hardly wait for all of Orion’s Apps and Preferences to be up and running. I should probably say “multiple WP sites” rather than “multi-site WP”, to avoid confusion. Thanks for the vote of confidence! I am another one who has had more than my fair share of problems with backups, as Nemanja can tell you. Most of the time they have been server-based, and I have had to get my web hosts to increase setting after setting to get even a reasonably reliable backup regime working for our clients, so I for one will welcome this upgrade with open arms! Thank you both for working with us on a solution and for your seemingly endless patience. Your feedback helped us on several levels, and I’m ecstatic that you’re finally happy with the Orion’s progress – it’s exactly what keeps us pushing for an even better, more reliable and innovative solutions. Looking forward to those beers! When it is released, will all of the updates from Orion be included in the package I currently have with ManageWP or will it require additional costs? It’s not building on the current ManageWP payment model – Orion will have its own payment model; you’ll be able to mix and match features for each site. In terms of current ManageWP, it’s like having two Professional, five Business and seven Free websites on a single account. That sounds both good and bad. I like the idea of being able to mix and match, but I worry about how it will end up costing in the end. I am currently on a lifetime 30% discount with ManageWP from taking advantage of a very early promotion. Will that still be honored with the Orion update? Both options have valid arguments, we still haven’t decided which one to go with. We no longer have the option to store backups in dropbox? Nope. Committing to a 99% reliable backup means we need to control the whole process. There are several technical reasons behind the decision of dropping Dropbox for now, we’ll go into more details in one of the next dev diaries. 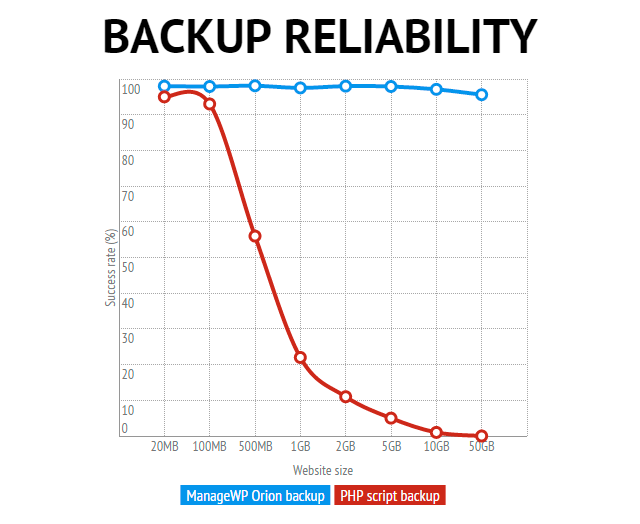 we have a lot of webs based on wordpress + custom scripts outside wordpress structure… will Orion Backup be able to only backup WordPress or will it catch the whole site? Currently only WordPress, but if it’s a file/folder referenced by WordPress, we can track it back in the file structure and include it in the backup. Could you get in touch with me via email at nemanja.aleksic _ managewp.com so you could tell me more about your setup? Now this is really sweet. I am using VaultPress for high profile sites, so this should really be able to do the heavy lifting instead! Keep going guys. No rush. Quality, Quality Quality! Amen, Sidd! As I already mentioned in the article, nobody can really afford a solution that works most of the time. It’s 99% or bust. BTW, any release dates in view? They could be really far – that OK, as long some dates are being thrown around 🙂 Thanks. Is the beta now fully functional? If yes, then an invite please. If not what is still missing? The dashboard itself is fully functional (website overview, plugin and theme updates, analytics, etc.). The client reports and backup & restore have also been implemented. Full functionality should be achieved in the next month or two, when we roll out the public beta. Sure! You’re both in the next batch of invites. Is the POD going to cost extra? The Hibernation Pod storage will be completely free. The backup will come in a free and a premium version (depending on your needs), but the Hibernation Pod itself will be free of charge. Can you already tell the difference between free and paid? Still haven’t made a final decision, but both free and premium backups will be fully functional. I have a particularly awkward site that is over 2Gb and have had to cease backing it up – I think my web hosting company aborts the process. Is there any chance of getting in on the beta to see if it works with this site?? It would be my pleasure – you’re in the next batch of invites. This looks incredible! How do we get an invite? 1. When will we be able to download, send offsite or restore backups (any will do)? It’s essentially useless for now and an issue given the backups don’t work on some of my sites in the regular version. When can we see these features functional?! 2. Will we be able to exclude folders, like in case we use another backup like BackupBuddy, so would be good to ignore large unnecessary files. 1. You can already restore backups, and they are being stored offsite in Hibernation Pod (our cloud storage). Download and Test Restore are coming soon. 2. 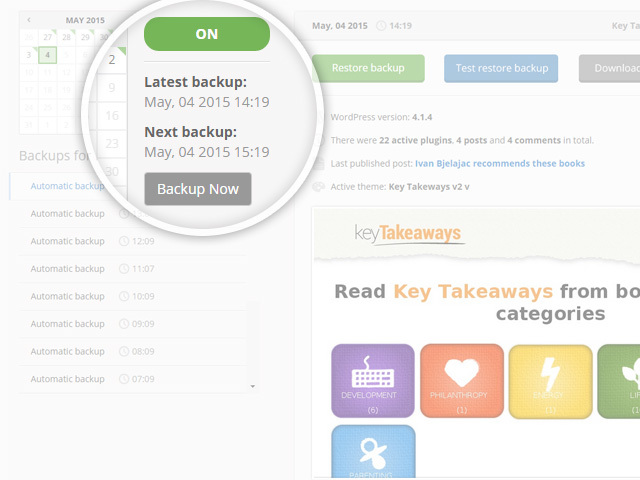 Other backups like BackupBuddy are already ignored automatically – this was our number one priority since in our current version of backup we had users with up to 20GB of various backup archives just lying around on their websites. We’re still discussing the most efficient way to handle the include/exclude issue. One way would be to handle it automatically; my personal favourite is to give you a tree view of your website so you could click your way to an ideal backup. Will keep you posted! +1 for the tree view! The lack of backup capability in Orion Beta is the reason I’ve not been using it. This new BU system sounds great. Our backups were spotty at best under the old ManageWP. One question – maybe Ive missed – but where the heck do these backups backup to?? Is it an internal storage system? We store all of our backups on Amazon S3. One more question.. when will we be able to add WP Multisite installs to Orion? The backups are assembled and stored offsite, on our own cloud infrastructure called Hibernation Pod. From there you’ll be able to download the backups if you wish and store them anywhere you’d like. The multisite is currently a hotly debated topic – if we will introduce multisite support, we need to greatly improve compatibility over what you have in the current ManageWP version. Thats great news, I like ManageWP, but am forever getting failed backups on larger sites which made me think of moving to Vaultpress. I am glad to hear of the changes and will try them out when I get a chance. Good stuff. This looks very promising. Has it been released yet? I still see Backups with the “soon!” in my dashboard, not clickable. Looks great, cant wait to be able to use it on all accounts! Well done! I would love to get an invite to the beta queue please. This sounds wonderful! It would be great if you could improve the client reporting feature with a) ability to write a short note to our clients; b) a more detailed reporting/dashboard style (like Google analytics) showing what we do for them each month. Thanks… keep up the outstanding work! I’m happy to inform you that both items are already planned for the next client report upgrade, but I’m not going to spoil the fun of reading the next developer diary that will focus on the client report and its future upgrades. My impression was that BackupBuddy didn’t work on WPEngine due to the architecture of their system, instead of being specifically disallowed due to resources – is that wrong? We are definitely interested in giving this a go. We have been relying on WPE’s backup solution and backupbuddy for our other sites in the past. Hopefully this can bring everything under the same solution! WP Engine has a server performance and security commitment to their users that they need to keep, so they disabled a lot of functions in their server configurations, namely proc_open. This forces us to use a fallback PHP script which uses way more server resources and is more more likely to be terminated by the server. Huh – that’s interesting. I always thought they had some odd cloud file architecture that prevented proper backups using traditional tools. I was also wishing they would add support to their backup solution to link to an S3 bucket or similar for 3rd party storage, but looks like you guys are beating them to the punch! Great work and I look forward to trying the beta! Can’t wait to see it! Are sites now able to be used on Orion Beta + current public release of ManageWP together or is it still one or the other? Thanks! Keep up the great work guys & gals! Still one or the other, unfortunately. We’re brainstorming a way around this, tho. Backups are a real issue for me, particularly full backups where only about 50% complete each time due to server resource issues. Do you have a rough idea when you are taking Orion out of beta? We’ll soon publish a road map with a detailed schedule, but generally we’re aiming for a summer release. Wow. Just wow. As an ex-hosting provider, versed with all the issues of server load, and CloudLinux’s resource-limiting problems, this is quite a feat. I’m on Orion now, will give this a run, expect all my clients to be added to my account, if this is as amazing as it sounds ! If you have time to benchmark the backup (server load most of all), please send us the data – at this stage of beta we want to test the backup with as many different server configs as possible. This is going to be an incredible boost to my workflow if this works as well as you suggest. How to make a great servic even greater. Any chance I could get in on the beta? I have a particular site that I have in mind to test the backup process with. Sounds like really useful and well thought out options – looking forward to testing these eventually. We’ve run the free-5 limited account for some time now, to test and see if this is a useful solution for us, which I think it is. I’ve been looking forward to upgrading to a “proper” account for some time, and it sounds like Orion will be a whole lot better still. Exciting. I don’t know if you’re aware of this, but a while back we decided that in Orion you’ll be able to add an unlimited number of free websites, as well as be able to mix and match free and premium websites, so you could keep everything in one place. I’m very interested in the new backup solutions, the current backup solution doesn’t work perfect for a huge site like mine and I waite to join my other sites. Is it possible to join the bèta te help testing the new backup solution ? Sure, I’ve added you to the closed beta queue, expect an invite within 24h. Once you’ve tested the backup please send us your feedback, we’d love to hear how it performed! Amazing work guys…this looks awesome! Can’t wait to see it in action.